Broadband Pricing or Private Network Performance? Converged MSPs Deliver Both. There is rarely a one-size fits all solution when it comes to technology in business. This is as true on the WAN as it is throughout the rest of IT. Consider the challenge of selecting a WAN solution that meets the demands of modern IT (cloud computing, mobile users, security, etc.). Topically, it seems that there is a clear tradeoff. MPLS (Multiprotocol Label Switching) has built a reputation for being reliable and high-performing between static sites (e.g. a branch office and HQ) but very expensive from a bandwidth perspective. On the other hand, SD-WAN has become known as a cost-effective and cloud-friendly WAN solution that isn’t as reliable as the legacy MPLS alternative. For these reasons, many businesses see their options for WAN solutions as coming down to a choice between cost and performance, which is an unattractive trade off no matter how you look at it. Fortunately, by leveraging solutions like SDWaaS (SD-WAN as a Service), converged MSPs (Managed Service Providers) can deliver businesses “the best of both worlds” by offering the flexibility and bandwidth-cost benefits of SD-WAN without sacrificing performance or reliability. In this piece, we’ll explore the pros and cons of MPLS and SD-WAN and then explain how converged MSPs can help businesses maintain a secure, high-performance WAN without breaking the bank. MPLS solved a specific set of problems that made it the go-to WAN solution of the early 2000s. By offering consistent, high-performance, dedicated links between two static locations in a way that was fairly secure (by way of isolation), MPLS was able to fit in well in an environment where WAN traffic was mostly between branch offices and corporate datacenters. However, the surge in popularity of cloud computing and mobile users created real challenges for organizations that depended on MPLS. For example, in order to audit Internet-bound traffic (e.g. to GSuite or AWS), enterprises had to backhaul the data through corporate datacenters before then routing it on to the public Internet. This created the “trombone routing” problem (named for the looping shape of the traffic) that negatively impacted performance. It also unnecessarily increased costs; not only is MPLS bandwidth expensive; businesses were paying for the same bandwidth twice, once over the MPLS network and again over the Internet. In short, for the modern WAN, MPLS became an inflexible and expensive solution. Over time, the downsides of MPLS became too much for many organizations to bear, and SD-WAN saw a rapid increase in popularity. There are a number of benefits SD-WAN offers over MPLS, so much so that industry experts at Gartner have suggested SD-WAN is killing MPLS. At a high-level, these benefits can be summarized as lower bandwidth costs, increased agility, and enhanced cloud & mobile friendliness. However, early Do-It-Yourself (DIY) appliance-based SD-WAN solutions had their own set of drawbacks. Security concerns-Where MPLS was dedicated to the organization leasing the line, SD-WAN brings the public Internet into the loop. This exposes enterprises to a whole new set of threats. Performance & reliability concerns- While bandwidth is cheaper when comparing public Internet to MPLS, performance often isn’t guaranteed, and jitter, packet loss, and reliability can vary significantly across regions and connection types. Varying circuit sizes– Broadband speeds vary across the globe and by connection type (e.g. fiber vs xDSL vs 4G LTE). This can create a real challenge for enterprises with large WANs spanning multiple geographic locations. Traditionally, MSPs would abstract away many of the challenges associated with the challenges early SD-WAN deployments faced by managing and optimizing the WAN. However, since many of the downsides of DIY SD-WAN were inherent to the underlying infrastructure, traditional MSPs could only do so much. In order to truly solve the problems, an MSP needs to offer more than just WAN management, they need to offer a reliable, secure backbone, and this is exactly what converged MSPs do. 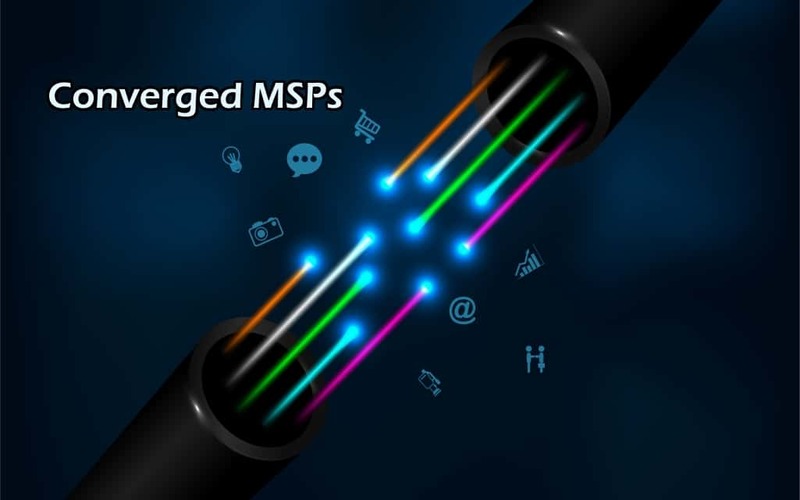 Converged MSPs are effectively service providers that also offer a full technology stack and robust private networks that add security and reliability to SD-WAN solutions. By supplementing the public Internet with an SLA-backed backbone with multiple Points-of-Presence (PoPs) and a full security stack (a.k.a. cloud-based SDWaaS), converged MSPs allow enterprises to reap the benefits of SD-WAN while avoiding the downsides of DIY solutions. From a security perspective, SDWaaS from converged MSPs offers like Next Generation Firewalls (NGFWs), Secure Web Gateways, (SWGs), advanced threat protection, and security analytics that are baked-in to the solution. Additionally, SDWaaS helps keep Edge Computing secure by using encrypted tunnels or IPsec-enabled devices (e.g. firewalls and mobile clients) to connect users to the corporate WAN. Further, converged MSPs are able to offer the inherent flexibility and cost benefits of DIY SD-WAN solutions, while using their robust infrastructure to solve reliability and performance issues. The SLA-backed global backbones help ensure that enterprises aren’t sacrificing reliability when they choose SD-WAN, and the multiple PoPs and built-in self-healing features help add enterprise-grade resilience to the underlying infrastructure. In short, partnering with a converged MSP that leverages modern SDWaaS technology can help enterprises ensure they get the most out of their WAN investment. By offering organizations the inherent benefits of SD-WAN with security & performance that matches or exceeds that of MPLS, converged MSPs enable “the best of both worlds” for enterprise WANs.